The story of a bunnie: Drama Queen Strikes again!! 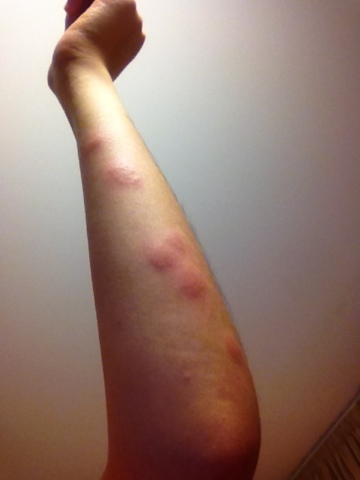 First time in my life getting severe bed bug bites so I have to blog this!!! might not seem so severe for you but for me, being the *drama queen*, IT IS. okay, you might say that I'm being very dirty but I got bed bug bites since the 1st week I came to Woolf College, my uni accommodation. 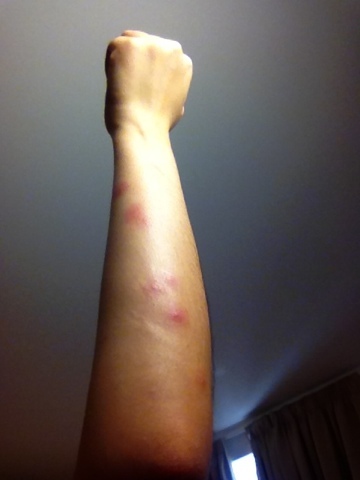 AND never in my life I got any stings/bites from bed bugs before so I just thought that it might be some ultra crazy mozzies which bites can itch for DAYS until I googled "bed bug bites" wtf. So for the past few months, I've been getting red marks one in a while, more like once a fortnight but it never really bothered me cause it was just one mark and I easily forgot bout the itchiness when I'm busy. I went straight to the reception and complained to the management and SHOWED them the marks. They followed me to my room and checked if there's any fleece? don't even know what's it. And of course they didn't find any else I would have found out already. =_= and they said they will inform the pest control people. Not satisfied after complaining on FB, to friends, to flatmates, to management, to*you*, I have to involve daddie so I called him on skype and showed him the marks AND made him worried, then only I stopped. FMFL!!!!!!!! it was so swollen. I WENT to management again after getting an email saying that those people are coming on Friday (yesterday). Can't believe I actually slept on the bed again. #lucky they did not sting else I will totally go to the management and give them punches and kicks. #ya right. On the third day, I went to London. 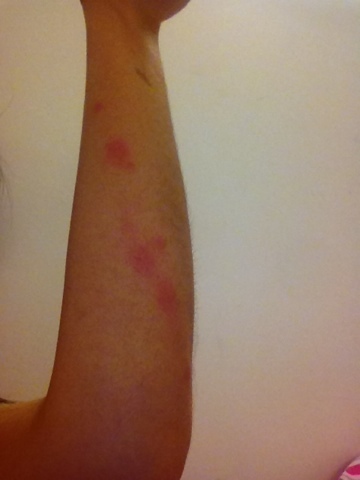 So not picture of the marks. Will *try* to blog bout it. =) First thing was to get ointment from Boots and it was really good. Cause I don't feel itchy after that but then it might be because of the cold weather too cause the itch stops when its cold. Once in a long while it gets itchy and I just need to put the cream again. I put like three times all together when I was in London if I'm not wrong. At the same time, those people finally came to disinfect my bed and floor. I removed my bed sheet and left nothing on the bed but not the floor before I head to London. The guys MOVED my shoes and dustbin and all the other things on the floor and put them on the BED. how SMART. but I was too tired to even get angry so I just put everything back on the floor clean the bed a bit, and put on my bed sheets.